Hoy pongo a prueba una nueva base de maquillaje low cost de Primark, la Longwear ultimate matte foundation. Os hago un review de la base y os comento mis primeras impresiones después de haberla probado durante 8 horas. Labial: MAC Retro Matte lipcolour "feels so grand"
The song of BASE DE MAQUILLAJE LOW COST A PRUEBA! / PRIMARK LONGWEAR ULTIMATE MATTE FOUNDATION is just for review only. 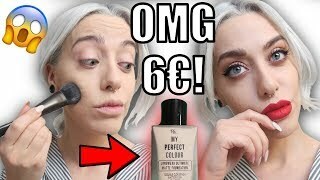 If you really love this song"BASE DE MAQUILLAJE LOW COST A PRUEBA! / PRIMARK LONGWEAR ULTIMATE MATTE FOUNDATION", please buy the original song to support author or singer of this song.